BankRI Turks Head Gallery: “Inside Nature: Paintings by Margaret Owen,” February 2 through March 1, 2017 at the BankRI Turks Head branch in downtown Providence at One Turks Head Place. Exhibit hours are Monday through Wednesday 8:30 a.m. to 4 p.m., and Thursday and Friday 8:30 a.m. to 5 p.m. For more information, contact www.bankri.com or call 401 574-1330. In a small sun-filled bungalow just north of Providence College, painter Margaret Own and her husband Michael, also a painter, live with their eleven-year old son. It’s a cheerful family home filled with strong bright colors, artwork of all shapes and sizes, and many, many legos. Her family moved to McLean, Virginia when she was eight and as she grew older, she began to visit museums and take in paintings by Mary Cassatt, Paul Cezanne, Edgar Degas and Henri Matisse. She visited the Phillips Collection in Washington, DC. “That’s where I met Bonnard and Rothko,” Owen explains, speaking of the French painter and colorist Pierre Bonnard and American painter Mark Rothko. 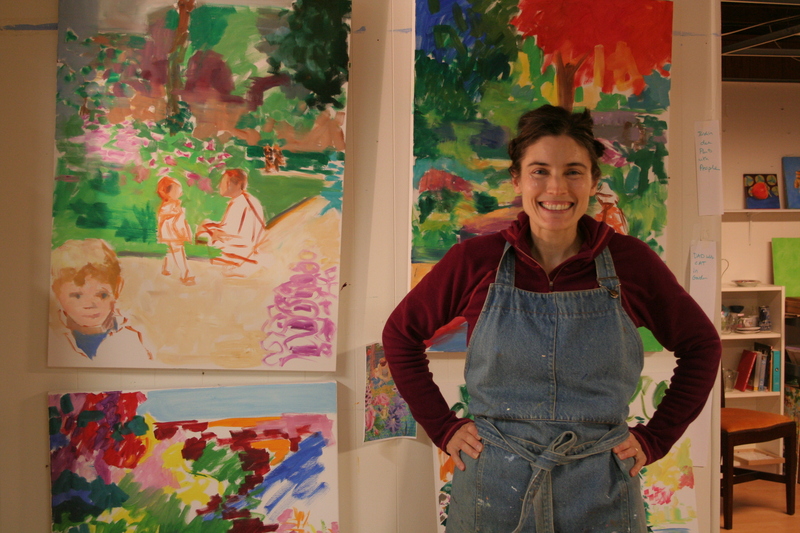 She attended the University of Georgia for her undergraduate degree and then went on to graduate school at the NY Academy of Art, which offers a traditional program in painting. “I loved getting to paint day after day from the figure,” Owen says, “and I got better at it.” She met Michael at the academy. They married, had their son and moved back to Rhode Island where Michael grew up. Today she paints whenever she gets a chance, a few hours at night when her son goes to bed and in the morning when he is at school. Her studio is down one flight of stairs in the large, open and surprisingly sunny basement. Hundreds of colorful paintings, watercolors and drawings line the walls. Large complex florals marry intricate patterns with bold vividly colored blossoms. Fluid atmospheric landscapes keep company with light-filled still lifes. Her good friend Canadian painter Elizabeth Hutchinson has also been an important influence in Owen’s creative endeavors. In 2012 they began traveling abroad together, first to Morocco to teach a workshop and paint. Later they visited Paris, France to paint and see paintings. All told, they made four trips to Morocco and two to France, a major achievement for anyone, never mind a mom juggling family with teaching and studio time. “At that time,” Owen says, “we were both seeking to push our art making outside the walls of the studio, to incorporate it into busy days when it seemed as though there was not time to paint.” The spontaneity of watercolor sketching outdoors inside nature drew them and they decided to create a blog, moveable paintbox, to share this small daily practice with each other, their students and other artists. 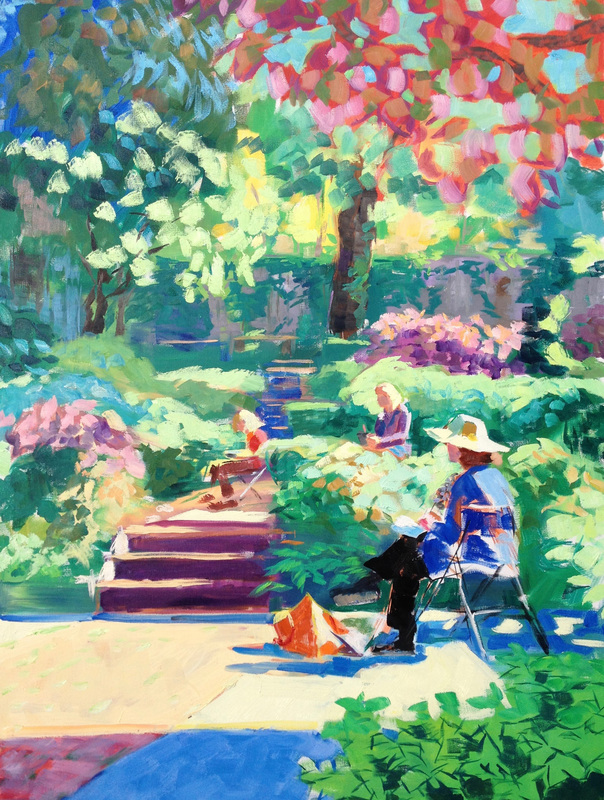 Amidst the color and the movement, she has added a new element – dappled light filtering in to let the canvas breathe. You can almost hear the sigh. Margaret Owen in her studio. This entry was posted in Bank RI and tagged Art, art gallery, art objects, arts, BankRI, community, Contemporary art Providence, entertainment, Free Art Rhode Island, gallery night, Gallery Night Providence, Margaret Owen, Modern art Rhode Island, NY Academy of Art, paintings, Paula Martiesian, providence rhode island, regency plaza, Rhode Island, Rhode Island Galleries, Things to do in providence, Things to do in Rhode Island, University of Georgia. Bookmark the permalink.